Those who do not remember history are bound to live through it again. Gossip: The whispers of Gehenna. The first Filipinos in America? The girl at the gas station. These words came into my mind when I first heard that our batch mate, Bong Pinas, passed away last March 2, 2012. The words are not for the departed one but is meant for the ones that are left behind—that would be all of us. 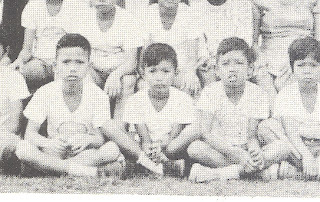 The earliest memory I have of Bong Pinas goes way back to 1969 when I attended kindergarten at Naga Parochial School. In the 1969-70 yearbook of Naga Parochial school, Bong Pinas’ picture is printed showing him wearing a white graduation gown and cap with a tassel. I can no longer recall where exactly Bong’s family resided in Naga City but I would sometimes see him walking along Jacob Street. When the Noche family, who is a close friend of our family, constructed a new house in Jacob extension, I would sometimes see Bong hang out with Jun and Robert Noche. I figured Bong must live somewhere in Jacob extension area. Bong is a very easy and outgoing person. 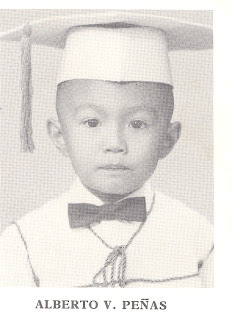 He seemed to not be bothered by school work because he would often say, “Mayo yan sa grado. Basta pasado, ok lang yan”. (It is not what grade you get. As long as the grade is a passing one, that is all fine). During our elementary days, Bong would sometimes come by our house to hang out with my brothers. During high school, it was believed that boys are turned into men if they smoke cigarettes and drink a type of alcoholic beverage. It is almost impossible to find a male student who went through four years of high school without trying a single puff on a cigarette or a sip of alcohol. (Rubbing alcohol does not count). Shading the boyish innocence and donning the manhood gallantry is considered a requirement to survive high school. The devils of these two vices polluted the developing minds of almost all my batch mates including yours truly and Bong Penas. During weekends, I would sometimes see Bong all boozed up with his bottle buddies along Jacob street, Bagumbayan Avenue or Ateneo Avenue. While enjoying the mint flavor of a “yosi” (cigarette), Bong would keep a close eye on the people walking by to make sure that none of them are Mr. “Tura” Destura, Mr. King “Pasi” Pasilaban or Mr. Vernon “Trino” De Los Trino, because these guys are the “Death Angels” of Ateneo De Naga’s Prefect of Disciple office. I remember attending the 15th or 16th birthday party of our friend, Jun Noche, at their residence in Jacob extension. 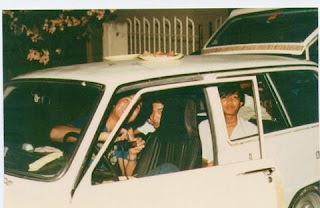 My brother, Alvin, sneaked out our family car, which was a white Mazda station wagon and picked up Bong Penas and Ricky “Guitarman” Sadiosa. I think we even picked up a group of pretty “Colegiala” friends of Jun and brought them to the Noche residence. I remember Bong admiring the spaghetti that Mrs. Noche prepared for the party. With the presence of the pretty Colegialas, all us boys were at our best behavior and did not drink a drop of beer. I could only recall the merriment during the party. After the Colegialas left, everything became blurry because I think alcohol was served. During college, I heard that Bong Penas lived in Manila for a time. I had a chance meeting with Bong in Manila while I was rushing to get to the airport. The jeep I was riding on got stuck in heavy traffic. I decided to get off the jeep and run between the rows of cars that were no longer moving. While I was running, I heard somebody call my name. When I stopped to look around, I spotted Bong riding a Toyota Tamaraw waving at me. Between puffs of breaths, I quickly greeted Bong but I had to quickly leave because I was running out of time to catch my plane. I think it was a few months after that brief meeting with Bong when I heard that Bong was hospitalized due to an overdose. Bong returned to Naga City and when I met him, I immediately noticed that he had speech impairment. Though I felt sorry for Bong, I treated him no different and kept our conversation normal. After awhile, Bong’s speech went back to normal and he returned to his usual bubbly self cracking jokes with everybody. Bong is one of those people who does not seemed to ran out of stories. He has jokes for every occasion and seemed to know everybody in the neighborhood. He had his share of youthful troubles but was able to survive them with a smile in his face. 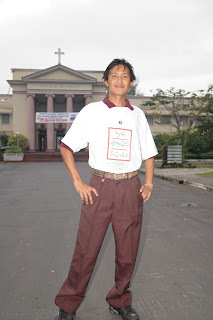 During the preparation of our high school batch’s 25th graduation anniversary, Bong did what he could to assist in the fund raising and preparation of the anniversary celebration. When the big anniversary reunion event finally arrived on December 2005, Bong joined his LG19 classmates in the celebration. I believe it was one of the happiest moments for Bong that year. During one of my visits to Naga, I asked my batch mates if they have seen Bong Penas. A few of them told me that Bong’s family lives near a slum area behind University of Nueva Caceres (UNC). One batch mate jokingly told me that there is an easy but effective way to find Bong. All I need to do is to bring a case of ice cold San Miguel beer near the entrance of the slum area. From there, I need to open one bottle of beer and let its aroma travel through the entrance of the slum. Bong will surely pick up the aroma of the beer and will come running out of the slum area following the scent of the brew. The last picture I saw of Bong was taken during the funeral wake of our batch mate, Braggy back in 2009. Bong seemed thin and frail in the picture. Though I am amazed that Bong has survived this long, I felt worried about his health. According to the news I heard, Bong was taken to the hospital on February 2012 due to problems with his lungs. 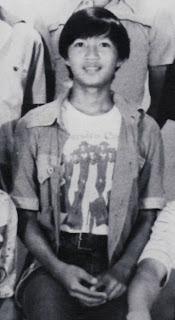 On March 2, 2012, Bong Penas died with his father on his side. Bong Penas might not have a lot of worldly possession but he lived a full life during his youth. Like all of us, Bong also had true friends that really cared for him. He struggled through adulthood but his body endured the hardship that was thrown his way. Though Bong became frail during his last years, in my memory, he will always be that friendly, loveable guy who has a welcoming personality and will always call everybody his pal. Bong, you are a good friend. Heartfelt condolences to Bong's family..He's a good friend and will always be remembered..thanks for the article, Ivan.. I was shocked to learn that Bong Penas has passed away. I could still imagine when he smiles with gusto though tiritipo na sya. He may have had a hard life but, in faith, I know a knight has returned triumphanly back to his beloved King. I hope Mighty80 could sponsor a Mass at the Ateneo chapel for him and our other departed brother knights and those who are in most trying time right now like Boyet T. If we could not give them something, at least lets give them our time. Lets pray for him and his family. I read majority of your articles and I have observed that each time a batchmate of yours died, an article is written as a tribute. I'm wondering why you skipped giving tribute to one of them, Doy Amihan, who died in Puerto Princesa last February 8, 2012. Just asking. I was not even aware that Jonathan "Doy" Amihan had passed away. I wish I can recall much about Doy Amihan. Hopefully another batch mate will be able to contribute enough memoir on Doy Amihan so that I can publish an article as a tribute to a batch mate.